When it comes to meditation there are too many misconceptions to count. 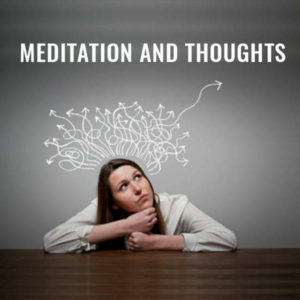 One of the big ones is that meditation is all about stopping thoughts. I’d heard about this, “still mind,” which could be apparently achieved through meditation, and I was desperate to experience it. While this state may be quite natural for the likes of a Zen monk that meditates 12 hours a day it certainly isn’t the experience of most people who have busy lives and who struggle to squeeze in ten to twenty minutes of meditation a day. When I first started meditating it felt like I’d opened up a floodgate of extra thoughts to my mind. Instead of my mind going quieter it got busier. No matter how hard I tried I couldn’t drown out the noise in my head when I sat down to meditate. I got so frustrated that I sought out an experienced meditation teacher to help with my dilemma. I ended up finding a teacher that was part of a long lineage of meditation teachers from India. He, and all the people that followed him were ordained monks and had been meditating for most of their lives. Now, I wasn’t interested in being a monk yet instinctively I knew that this was the person that could help me. Fortunately, they ran meditation programs for visitors so I was allowed to join a two-week meditation retreat. This retreat consisted of doing what was called ’rounding’ meditations from 6 am to 8 pm every day. We would do an hour of meditation followed by an hour of yoga followed by 30 minutes of silent walking or contemplation. We also had an hour break for breakfast and lunch which we ate mostly light food like fruit and vegetables. There was no communication allowed between participants unless it was part of a group sharing session where we could give feedback about our experiences and ask questions about our meditation practice. As you could image this was quite confronting for me as I’d never meditated more than thirty minutes before and even then I found it impossible to sit still and shut my mind up. This took it to a whole new level of discomfort and mental and physical exhaustion. All the while I noticed the monks that were joining us during these sessions appeared to be perfectly calm and relaxed all the time. I could literally see their eyes shining when I looked at them as they seemed full of aliveness and clarity. I knew I wanted to experience what they seemed to experience and it was frustrating me to no end that every time I sat down to meditate my body would instantly start aching. This made it nearly impossible for me to relax at all. My mind just wouldn’t let go of being upset about my body hurting and how I was failing at meditation. Little did I know then but this was to become my first major breakthrough in meditating deeply. During one of the sharing sessions I mentioned what I was experiencing to my teacher and he simply looked at me, smiled with compassion in his eyes and told me to embrace what was going on for my body. I must say that this puzzled me a bit as at that time I had no idea what this actually meant. He didn’t say anything else to me except those words so that was all I had to go on. It was with great anticipation that I approached my next meditation session so that I could practice ’embracing’ my body. Sure enough, as soon as I sat down my body instantly started to ache. In case I didn’t explain it we all had to sit cross legged on cushions on a wooden floor which of course didn’t help much with relaxing or being comfortable. As I sat there noticing my back aching, my knees feeling like they were on fire and my feet hurting against the wooden floor, I took a moment to open my eyes and look at how others were doing around the room. That’s when I noticed that some people had yoga mats under their cushions while others had portable padded floor chairs with a back support. I even noticed that some of the more elderly people were actually sitting on chairs in the back of the room. As I took in all this information I kept hearing my teachers voice telling me to embrace my body during meditation. That’s when it occurred to me that rather than being frustrated with my body and all the negative thoughts that this brought up I needed to listen to what it was telling me. That’s when everything started to shift. As I tuned into my body and where it was aching I thought about how I could be kinder to it so that it wasn’t in pain. Without knowing it I was on my way to embracing my body and giving it what it needed so I could relax and meditate peacefully. The very next session I came armed with a yoga mat and a padded floor chair. This worked wonders. My back was no longer aching and if my knees started to hurt I would simply straighten my legs to get comfortable which instantly got rid of the pain. I felt so relieved that I could now sit and meditate without my body driving me crazy and all it took was to be kind to it instead of continuing to torture it. However, now that my body was quiet my mind was noisier than ever. This was my next big test – how did I get my mind to shut up so I could meditate? After a little while I couldn’t bare it any longer so I raised my hand again in one of our group sharing sessions and asked what I could do to stop the noise in my head. Once again my teacher gave me a compassionate look and told me to embrace my thoughts instead of trying to push them away. Now, he didn’t explain exactly how that worked as he was a man of few words so I knew I had to figure that part out for myself. So armed with this new knowledge I eagerly dived into my next meditation session to explore embracing my thoughts. By this stage, I was still only at day three of the meditation retreat yet it felt like I’d been there for weeks. During this day I decided to stop fighting my mind and just let it do whatever it wanted. imagined that I was sitting on the side of a busy road watching cars go by and that each of my thoughts was a car on the freeway of my mind. As soon as I started to observe my thoughts rather than get frustrated by them I instantly felt an sense of easiness wash over me. I felt like I was becoming separate from my thoughts and instead of being overpowered by them they were moving into the background. It was almost as if I could see them come and go and the more I remembered to just accept them, the less bothersome they became. This was when is I stared to realize that i was not my thoughts. They were simply something that appeared to be happening all the time on the freeway of my mind. It was on this day that suddenly it all made sense. Meditation simply made me more aware of the thoughts that were already there. In my daily life I was too preoccupied to notice what was going on in the background of my mind but by sitting down and being forced to look at them they had become more obvious. So it wasn’t that meditation was making my mind busy – it was already this way. When I’d first started meditating at the reatreat I’d being trying hard to get rid of my thoughts to achieve a quiet calm mind. It was obvious now that this would never have worked. Instead, I was now approaching my meditations with an attitude of open curiosity about watching my thoughts go by and as I did so my perception of my thoughts was starting to change. No longer were they something to be avoided or judged. They were something that I was able to step back from which gave rise to a sense of increased space in my head. Sometimes, I would forget to watch my thoughts and I would catch myself getting caught up in a train of thoughts or feelings. As soon as I noticed that I was doing this then I was able to go back to watching again and those thoughts and feelings would come and go uninterrupted. From day four onward my meditations got easier and easier to just sit and watch the thoughts go by. Just by practicing this process of meditation I started to feel a deeper sense of calmness and clarity than I ever had before. To say that these two weeks transformed my life is a complete understatement. Not only were my meditations now simple, fun and easy, I had such a different relationship with my mind and body that every area of my life started to change for the better. Sure, I kinda dove into the deep end of meditation early on but it helped to set me on a lifelong journey of exploring where meditation could take me both as a student and a teacher. It also helped to dissolve many of the misconceptions I had around meditation which allowed me to keep going and not give up. I truly believe that meditation can work for anyone as I have seen it time and time again with people who firmly believed that it could never work for them. So my challenge to you is that if meditation is not working for you – then find a better teacher because the benefits of meditation far outweigh staying stuck in a busy mind.